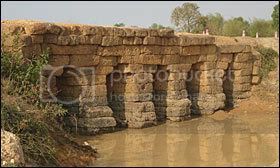 30 August 2007 (The World Bank) – This story draws attention on an ancient highway between Siem Reap and a neighbouring province, and steps taken to preserve the ancient laterite bridges. Not that the bridges have been deteriorating – which should say something about the quality of the structures, but bypass routes and bridges should ensure that they will last for even longer. Following a route along an ancient Angkor highway dating from the 12th – 13th Century, National Road No. 6 (NR6) connects Siem Reap and Kompong Thom provinces. Recent rehabilitation activities drew special attention to the need for Cambodia to protect these unique cultural assets from increasing vehicle and heavy traffic. With a view to preserve the authenticity and historical value of the ancient bridges, the APSARA Authority for the Protection ad Management of Angkor and the Region of Siem Reap permitted the Ministry of Public Works and Transport to build 10 bypasses with new bridges around minor ancient bridges and a 1.3 km Kampong Kdei bypass and new bridge to divert traffic off the ancient bridges and onto the new bypasses, in conformity with UNESCOâ€™s ad hoc expert group recommendations of December 2004.